Earlier today, we showed you an unannounced LG smartphone that was recently certified in China. We assumed that this was the rumored LG G4 Pro (or LG G4 Note), but that may actually not be true. 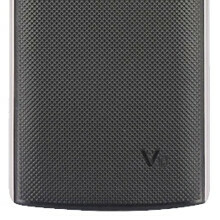 As @evleaks is pointing out, the new handset has a "V10" logo on the back, so this might be its final name: LG V10. According to @evleaks, the device sports a 5.7-inch Quad HD (1440 x 2560 pixels) display, and - like the LG G4 - it's powered by a six-core Qualcomm Snapdragon 808 processor. Other features should include a fingerprint scanner, a 5 MP front-facing camera, 16 MP rear camera, 3 GB of RAM, 64 GB of storage space, and microSD card support. Interestingly, @evleaks has it that the new LG smartphone features a secondary display. This seems to be located at the top of the phone, above the main display and below the speaker grille, on the right side of what are probably the front-facing camera and another sensor. This auxiliary display resembles the secondary screen of the Samsung Continuum, an Android smartphone released way back in 2010 (though this had its second display located at the bottom). The LG V10 is expected to be released sometime in October. For now, there's no word on its price, but we assume the handset won't be cheap. LG V10 photos with increased luminosity - V10 logo and asymmetrical top display visible. I agree with you that it looks good. I prefer the look of it to the G4. Having said that, it looks like the same specs of the G4 with a bigger screen (and apparently a secondary screen). what are the specific differences other than those? It better be cheap, because the days of overpriced phones are OVER. EVERY phone now has to compete with a $180 Moto G and $399 Moto X Pure. I'm buying the LG Nexus 2015, but really want a LG G4 PRO with a fingerprint scanner. Downward pressure and this race to the bottom in price are going to make it literally impossible for phone manufacturers to make a profit. Most of these companies that are selling their devices for rock bottom prices are even selling them at cost, or at a loss. You are celebrating what is going to absolutely destroy research and development and new ideas for the Android Market. Simply because a lot of these companies won't have the cash to work on more expensive and grandiose projects. While working with the bare necessities is indeed the mother of invention, I'm not so sure how far that is true with corporations. What you see as a consumer in rock bottom prices is certainly good for you. The cost of that however is innovation and invention. Using off-the-shelf parts and slapping them together in a cheap phone isn't really contributing anything new. And when you only have to pay engineering costs because you are using someone else's intellectual property, that isn't exactly expensive either. That's true barring new software ideas since the cost of development for that isn't anywhere near as high. You call it overpriced, I disagree with you. That's the same logic of saying that Mercedes, Audi, and BMW are all over priced when it is their inventions and ideas that trickle out throughout the lower market. That's the way it works. The high end is where invention rests usually. Do you have any actual facts or objective points to make? I don't mind debate, but if you just want to be a troll then I have better things to do. I... just realized you were probably mocking QWERTY. And now I feel like Johnny jackass. My bad, slow moment. Don't sweat it mate, you make a lot of sense in your posts. Wait a year or two, you will get the LG G4 PRO cheap. Wonder what this offers over the G4? Bigger screen, worse battery than the already s**tty in G4 and probably a gimmick of a weird secondary screen. this phone will have a long lasting and battry life than g4. better camera, better screen, better design and better and bigger RAM. where is the speaker location?looks awkward the 2 front cam below the top bezel. Am I the only one who thought the Continuum was the coolest Galaxy S phone? THEY LOOK VERY DIFFERENT. THE POWER BUTTON IS ON THE BACK THE SPEAKER IS ON THE BOTTOM THE BEZELS IS VERY THIN THERE IS A LAZER AND DUAL LED FLASH TOO LG G4 pro is more Rectangular while the Samsung s is more Oblong TOTALLY DEFFERENT DESIGN. They look completely identical to me. In fact, I'm pretty sure I can get this exact phone on eBay for $40. Hey LG, 2010 called and it wants the design for the Samsung Continuum back. you need a doctor to check up your eyes. from the size ,shape, and design they are very different. THIS IS BETTR THAN SAMSUNG S SERIES. Crap! No front facing speakers? ITS NOT CRAP BY JUST NOT HAVING A FRONT SPEAKERS. THE SPEAKERS IS EVEN BETTER ON THE BOTTOM. BY THE WAY THIS IS A VERY GOOD LOOKING PHONE. WEATHER YOU LIKE IT OR NOT. He wasn't calling it crap, he was playing craps while asking a legitimate question, which I will now definitively answer. This does not appear to have front facing speakers. It is therefore not a very good looking phone, and I do not like it no matter what the weather is like. I just realised it has the cheap hard plastic from the Galaxy S2. I expect better from LG. I like the idea of the second display as it means you can access some features without wasting power on the big display making it more power efficient just looking at notifications.